It’s another exciting night for AMERICAN IDOL on FOX. Season 13 is really heating up and the remaining 9 singers perform their favorite tunes with Rickey Minor and his band. On last week’s performance show the Top 10 – Caleb Johnson, JessicaMeuse, MK Nobilette, Alex Preston, Dexter Roberts, Majesty Rose, Malaya Watson and Sam Woolf, C.J. Harris and Jena Irene – performed songs on the “Top 10 Sings Top 10” – themed performance show. Song selections had to be a Top 10 song from 2010 to the present. Did you happen to catch the last episode and see which cast member was sent home? If not we recapped who got the boot and it’s all right here for you. On tonight’s episode the Top Nine – C.J. 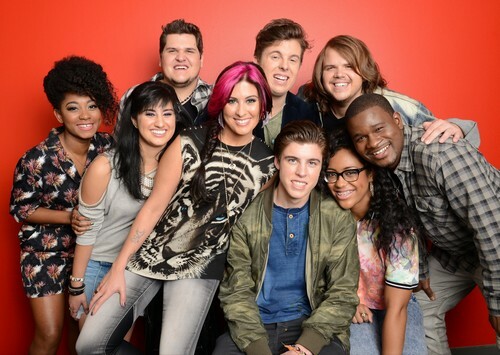 Harris, Jena Irene, Caleb Johnson, Jessica Meuse, Alex Preston, Dexter Roberts, Majesty Rose, Malaya Watson and Sam Woolf – will perform on the “(I’m With The) BAND!”– themed performance show. The IDOL hopefuls will act as the lead singer for Rickey Minor and his band, performing their favorite songs. Tonight’s show is going to be an exciting one, which I’m not going to miss and neither should you. Tune in tonight at 8 PM EST! Celeb Dirty Laundry is your go to place for all the up-to-date American Idol News and we’ll be recapping the performances right here for you. Do you have a favorite so far? Hit up the comments and let us know who you really like! Judges Comments: Harry – “You know how when people start out in their careers they are always compared to someone. When you sing this song, it’s tough. For me this might have been one of my favorite performances you have done. It was a suttle change but it felt focused, I think you may have been thinking of what the song meant to you. This performance seemed different to me. Im proud of you, great job.” Keith – “You look great, I love the way you look. You look comfortable which is good. Part of what you gotta work on now if you want to do this is being as comfortable without your instrument as you are with it. When Stevie does it, I go into Stevie. You gotta do something more like that. Keep that in mind when you choose the song.” Jennifer – “I think what Harry was referring to is your confidence is improving, I could see it in the monitors when you were connecting with the audience. Again, taking on a Stevie Nicks number, your voice is beautiful, I could listen to you sing all day, but you gotta draw us in. You gotta do something that makes us want to watch you, not just listen to you. Judges Comments: Keith – “How are you feeling tonight, are you missing home? Personally, I think that was a clever choice to do that, it allowed you to tap into the soulful side of you. All I would ask is be careful that you don’t confused the sound of expressing with the feeling of expressing. That’s a big difference, when you pull it from within here to out-the response would be different.” Jennifer – “I also think this was a good choice for you. I never get tired of hearing your voice because you have a unique sound. With you CJ it is going to be about consistency, I wish I had known the song you were doing better, I couldn’t be there with you.” Harry – “CJ when I preform I think of it like being a juggler, you gotta keep the connection with the audience, the lyrics, the intonation going. There’s a lot of stuff you gotta do that the audience doesn’t realize what is going on. I’m going to pound home, you can hear CJ I know you have good ears. Sit down to a piano and pound the notes out, you have to work on your pitch. I think it was a good performance but you have potential to do better next week. The end, don’t forget to come back tomorrow to find out who is sent home!